A Skirmish is a battle between your clan’s detachment and an enemy detachment on a neutral territory. The enemy and map are selected at random. 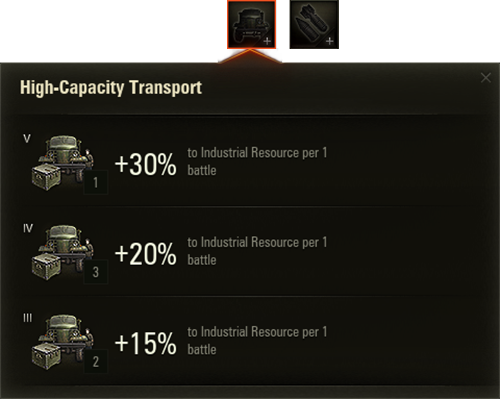 Every clan that participates in Skirmishes gets Industrial Resource depending on the outcome of the battle, with the winning side receiving a greater reward. Industrial Resource earned in Skirmishes is accumulated in the Stronghold Storage. Skirmishes are available during certain periods of time. To view the schedule of upcoming battles, click (Battle schedule) to the right of the Clan Battles button in your Stronghold, or in the Stronghold: Battles window. Create your own detachment. If you are a member of a clan, you can create your own detachment and become its commander. Join a detachment. Whether you are a clan member or not, you can join an existing detachment as a volunteer (see Joining a Detachment). You can participate in Skirmishes in one of three divisions. The division determines the vehicle tier, battle format, and the number of legionnaires in the detachment. Clans earn more Industrial Resource in higher-division Skirmishes. To create your own detachment and become its commander, click Create Detachment in the Stronghold: Battles window. 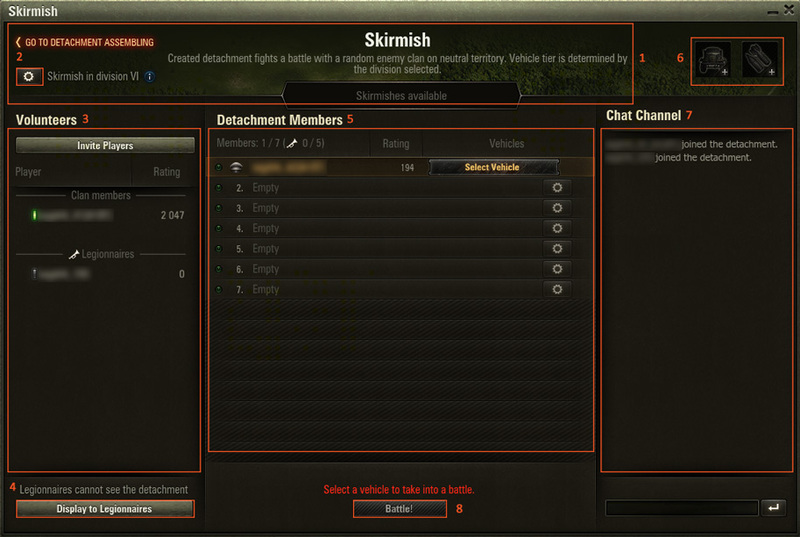 In the Mode Selection window displayed, select a division for the Skirmish. 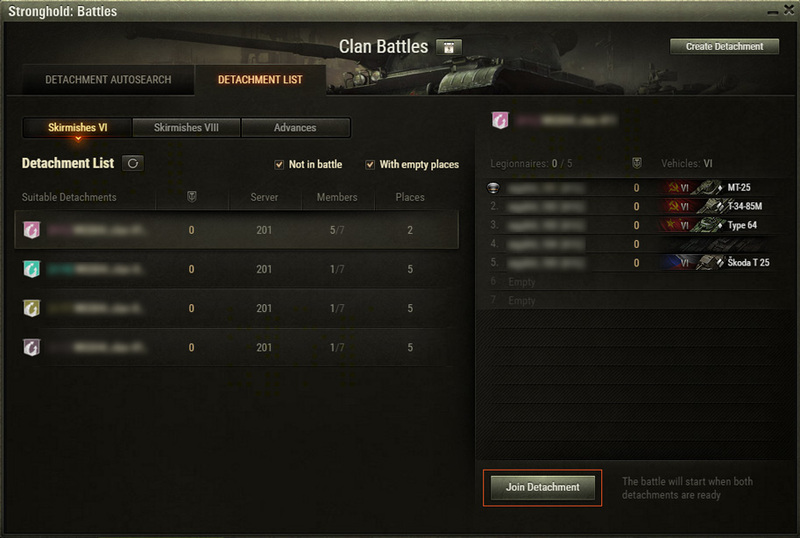 The list of the divisions is displayed in the left part of the Mode Selection window. Information tooltip. Description of the mode. List of divisions. Vehicle tiers, number of players in a detachment, duration of the battle, and maximum number of legionnaires. 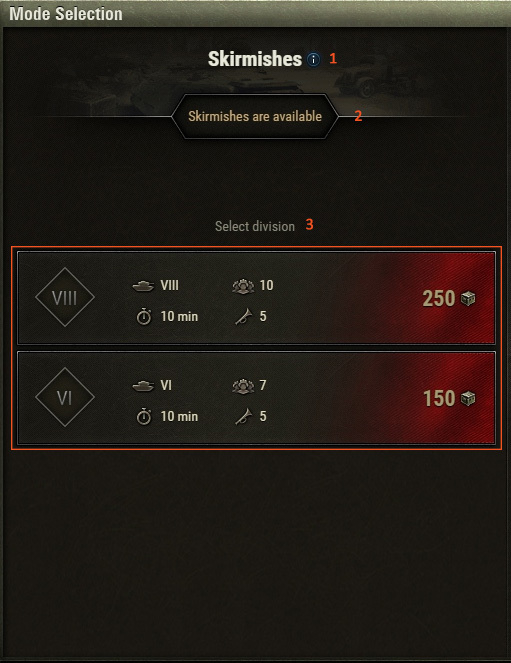 After you select a division, the Skirmish window is displayed. Here you can form a detachment, enable Reserves, and confirm that you’re ready for battle. Information panel. Selected division and Skirmish status. Settings. Change the division or battle mode. If you change settings, your detachment is not affected. A list of Volunteers. Invite players and add them to your detachment. The list includes both fellow clan members and legionnaires. Display to Legionnaires button. Click to allow legionnaires to see your detachment in the Detachment List and join it as volunteers. Only the Detachment Commander can open the detachment for legionnaires. Detachment members, their status, rating, and selected vehicle. Click Select Vehicle to choose the best vehicle for the Skirmish. Battle! button. Click to confirm that you’re ready for the Skirmish and send your detachment into battle. 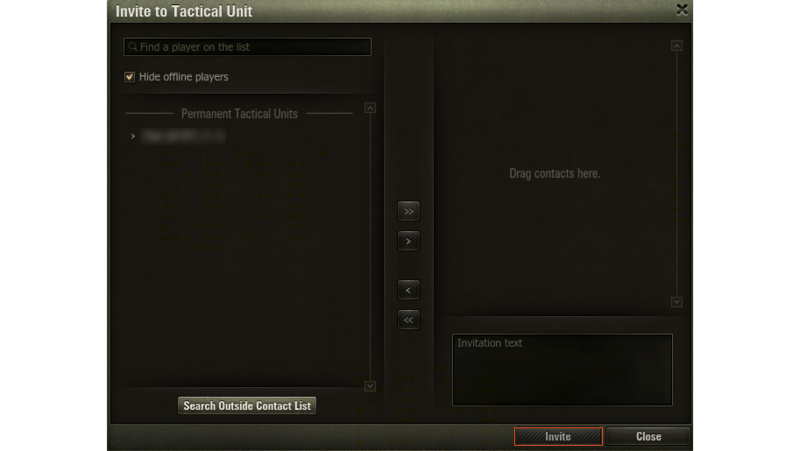 You can add players to the detachment via an invitation or with the help of legionnaire autosearch. Any clan member in the detachment can invite players to it. You can invite both fellow clan members and other players, which in this case will join the detachment as legionnaires. Remember that the maximum number of legionnaires in the detachment depends on the division you’ve selected. In the Skirmish window, click Invite Players. Invited players are added to the Volunteers list and displayed either in the Clan Members group or the Legionnaires group. Players’ personal ratings are displayed to the right of their names. The Detachment Commander can add the invited players to the detachment by dragging them from the Volunteers list to the Detachment Members list. A special icon marks legionnaires in the detachment. The clan Commander, Executive Officer, Personnel Officer, and Combat Officer can withdraw Commander permissions from any player, including those of higher rank. To withdraw permissions from the Detachment Commander, right-click the player’s name in the detachment list and select Take Commander's permissions. To pass the Detachment Commander’s permissions to a member of your clan, right-click a player’s name and select Transfer Commander’s permissions. The Detachment Commander can transfer permissions only to a fellow clan member. Go to the DETACHMENT AUTOSEARCH tab. On the My clan's detachments panel, click the detachment you need. Click Join Detachment in the window displayed. In the Skirmish window, your name will be displayed in the Volunteers list. Click Take Slot in a free slot in the Detachment Members list or wait until the Detachment Commander adds you to the detachment. Other clans’ open detachments. You can join them to engage in a Skirmish as a legionnaire. Go to the DETACHMENT LIST tab and select a division for the Skirmish. Click the detachment you need in the Detachment List. To the right, you can see the detachment members, their ratings, and vehicles. To join a detachment via an invitation from another player, click Accept in the invitation notification in your Garage. You can also accept invitations in the invitations and friend requests tab in the Notification Center in the lower right corner of the Garage. After you accept the invitation, your name will be displayed in the Volunteers list. Wait until the Detachment Commander adds you to the detachment. To gain an additional advantage in the Skirmish, use One-Time-Effect Reserves. When the detachment is formed and the players are ready, the Detachment Commander sends the detachment into battle. The enemy detachment and map are selected at random, and the Skirmish begins. Teams fight a Standard battle. When the Skirmish ends, its results are calculated. The clans get Industrial Resource, with the winner receiving a greater reward. The amount of Industrial Resource also depends on the Reserves you used. Remember that legionnaires get some of the earned Industrial Resource (see Legionnaire Reward).